Buying a cat condo activity tree for your cat isn’t just a sign of wealth and luxury. In fact, it can offer benefits that your cat would surely appreciate. Human beings depend on a horizontal world. Cats live in a vertical world. Hence, their safety depends on elevated and high areas. The cat activity tree offers additional playing options and exercise. If you notice that your kitty keeps on hanging out at the top of your cabinet or refrigerator, maybe it’s about time you invest in an activity tree for your cat. Allow us to help you by presenting the top 10 bet cat condos activity trees you’ll surely love! This one of a kind cat tree mimics the look of a real tree house for your cat. It’s easy to assemble. Within minutes, you can erect it on the ground and let your cat play with it the whole day. Aside from this natural brown color, you can also choose from other colors available for this model. Replacement posts are available in case your cat accidentally destroys one. Now you can give your cat the taste of wildlife in the comfort of your own home. There are two-bedroom areas that allow your cat to nap anytime, and it’s closer to the ground for their safety. Platforms on the higher level provide a playing field for your feline. Realistic-looking leaves adorn the model so that your cat will think it is hanging out in the forest! The simplistic design of this cat tree can easily blend into your existing home interior. With its large beds and rest areas, you need not worry about your medium-sized cat not fitting in. Its solid construction, high-quality carpet, and durable materials is a sign that this activity tree can last for a long time. 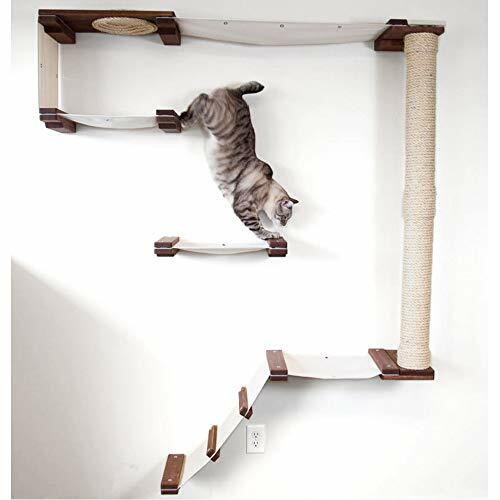 It’s an excellent gift for cats who love to play and hang out in an elevated area. It also features an all natural thick sisal rope that allows your cat to dig its claws into. This model is handmade in the USA, and there is no assembly required upon arrival. The real look-out tower for your kitty will make it feel as if he’s in total control of everything. This model was featured on Animal Planet for a good reason. 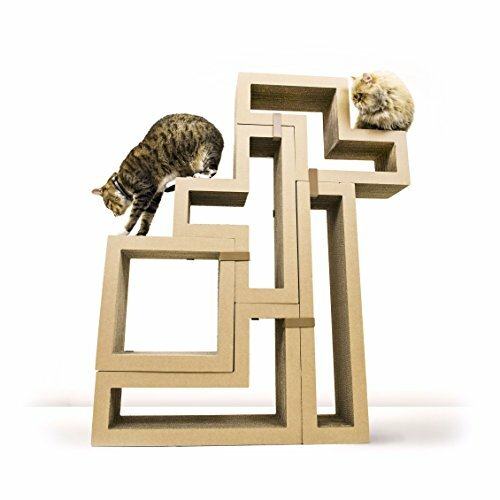 It has five blocks that allow you to quickly build a cat tree, a sturdy bookshelf, a cat scratcher, a cat climber, or even a coffee table! Nothing stops you but your imagination. The stylish modern design will easily complement with the existing interior design of your home. Its natural beige color makes it feel cozier. It is built for large cats with its sturdy and durable materials. This cat tree can accommodate up to 300 pounds. You need not worry about your two kitties hanging out in elevated areas of this cat tree. Ten clips are included in the package that allows you to secure the blocks together. If you are worried how to entice your cat with this cool-looking cat scratcher, do not worry because there are extra five bags of natural catnip included. Looking for cat activity tree that looks good when mounted on the wall? Check out this model from CatastrophiCreations! The beautiful craftsmanship of this model makes it look good in any existing interior of your house. Its large size can accommodate larger-sized cats with no worries. It’s also the perfect playing options if you want your cat to exercise more often. You can remove the fabric from this model if you want to wash and clean it. This cat tree accommodates your cat’s climbing needs. It is available in onyx black, onyx natural, unfinished black, unfinished natural, and English chestnut color. 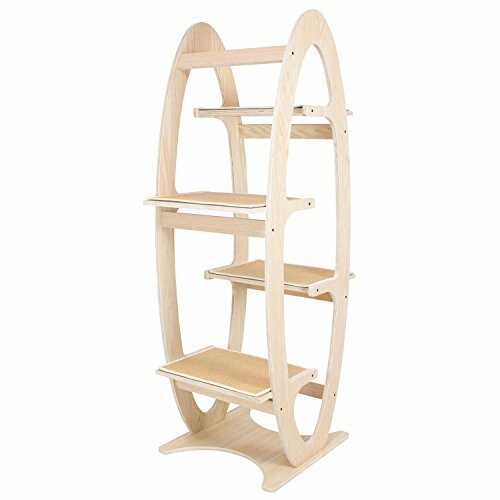 This white beautiful cat tree offers six separate levels that allow your cat to climb and play in elevated areas. Other spaces can be used for decorations and for storing your books or other light materials. On the second and fourth floor, a high-quality carpet is installed that allows your cat for lounging freely. The cubby hole is the perfect place for hiding and sleeping. It can accommodate even large-sized cats. The model is built to last for a long time. It’s glossy and elegant-looking. 100% non-toxic materials build up this cat tree for the safety of your cats. Lead-free paint is used so there is nothing to worry about when it comes to your cat’s health. 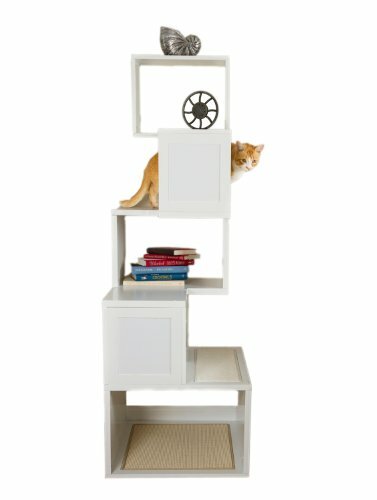 Your cat will surely love this modern cat tower with a stylish design. 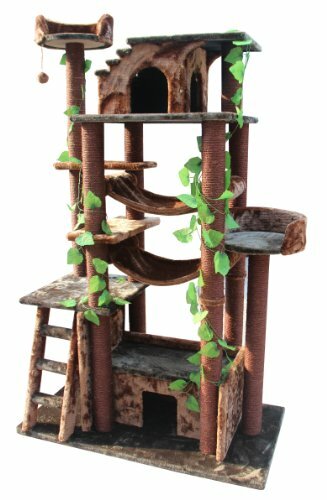 This cat climb tree can serve as both your cat’s lounging area and a beautiful piece of furniture inside your house. The natural finishings of wood makes it easier for you to blend this designer cat furniture in your living room or patio. 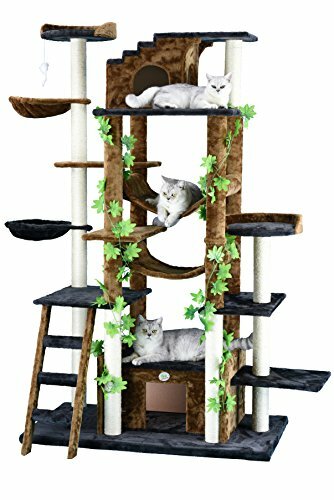 Four carpeted platforms allow your cat to climb the activity tree easily and reach the highest perch. Since there is no finishing for this furniture, it gives you the luxury to paint it your style! This cat activity tree helps your cat get more active and exercise more. It can accommodate large-sized cats for a comfortable and cozy lounge. This designer cat lounge tree will surely entice your cats the moment you assemble it. You can make your cat the king of the jungle with this exotic cat activity tree. 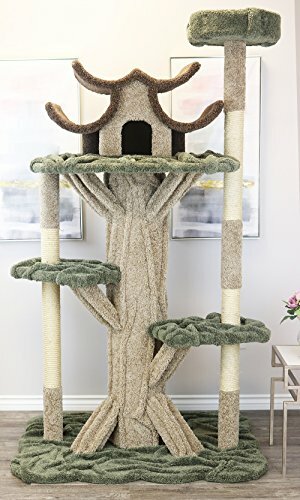 This forest cat tree offers several perches, three condos, and three hammocks where your cat can lounge anytime they want. Its large size is to accommodate bigger cats. The solid construction of this model allows a group of cats to hang out in this area. There are plastic leave vines to make the cat tree more realistic. A closed condo on the first level allows your cat to sleep in during the night and also features a little ladder for easy climbing. Some poles allow you to hang small toys. 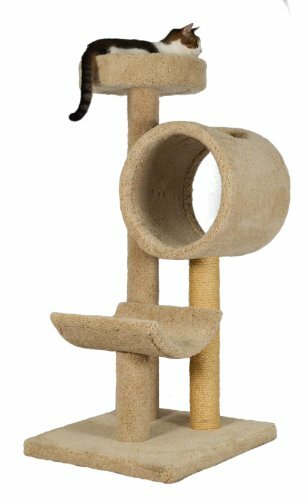 This beige-color designer cat tree will allow your cats to have a good time and play around all day long! It has several condo houses for your cat to sleep when tired, two large-sized baskets, 24 hanging toys, and a faux fur board material to dig his claws into. There is also a sizeable top bed for your cats that like to sleep in elevated areas. It can easily blend with your existing interior design thanks to its neutral color and modern style. For cats that love to play outside, you need not worry about their safety anymore. Once you entice them in this cat tree, you can rest assured that your cats can exercise at the safety of your own home. You can attach the adjustable top pole to the ceiling if you want to mount the cat tree to the wall. This handcrafted cat lounge tree is the perfect gift for your kitties. The solid wood, plush household grade carpet, unoiled sisal rope, and sonic tubes are all made and assembled in the USA. It comes fully assembled, so all you need to do is erect it on the ground for your cat to use. Thick green carpet is also found in base and platform of every level. The trunk, house, and posts are wrapped in a beige rug, and the roof is in an earthy color. The cat nesting perch is about the height of the window, the perfect lounging area for your cats during the afternoon. Two natural wood posts allow your cat to dig his claws into. A long tunnel is designed for your cat to sleep and hide during the night. 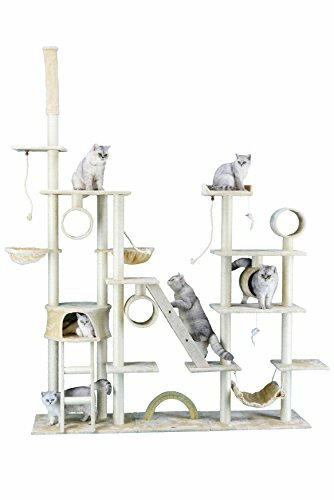 This giant cat activity tree allows your cat to play and rest all day long. It features two large condos and five perches for your large-sized cats. Durable materials are used to last for a long time. The high-quality carpets will make the climbing much more comfortable. Your cats will never scratch on your furniture again thanks to its all natural thick sisal rope. Made in the USA model, this cat lounging area requires no assembly at all. Upon arrival, all you need to do is inspect it, and it’s ready to use. The two large poles ensure stability while your cats are hanging out in this tree. It also allows you to hang toys for your cats to play with so they may never have to go outside the house!